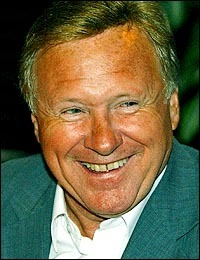 DIDDY David Hamilton said thank you my Sun after winning back his job as Fulhams Tannoy announcer. The Radio One legend was axed after 10 years because he could not whip up the fans into a frenzy. But SunSports Diddygate campaign forced Fulham into a U-turn  after just ONE game. Last night Diddy said: Id like to thank The Sun and it's army of readers, and all Fulham fans for their support. "They helped me return to the job I love at the club which I've always loved." Lifelong Fulham fan Diddy, 62, will be back behind the mike at Craven Cottage for tonight's clash with Middlesbrough. He added: "It will be an emotional night. Diddygate has touched a nerve." A whopping 87 per cent of readers who joined SunSport's phone poll wanted Diddy reinstated. Chairman Mohamed Fayed made the decision after criticism of the shambolic entertainment before Saturday's 2-0 win over Bolton. He summoned Diddy to a meeting on Monday and told him he was back by popular demand. His replacement, Dominic Frisby, lasted just one match in the job. Fulham admitted Sun readers had forced their climbdown. A statement said: "The Sun's campaign obtained the backing of the majority of our supporters who expressed a view. "In response to that backing, the club will be welcoming David back to the mike at Craven Cottage for the rest of the season."